Tinolang tahong is a simple Pinoy way of cooking tahong or mussels. The broth of tinolang tahong is very refreshing. The best way to cook is first boil the water with the aromatics before adding the mussels. Should you prefer more broth then you have to add more water and little salt to taste. Lemongrass could be boiled with the water if you want an additional zest to the dish. Overcooking will shrink the mussel meat therefore it is very important that is should be cooked until the shells had opened. Wash mussels and place in a bowl, cover with water and let sit in for several hours to allow the mussels to expel dirt and discard water, wash and drain. In a wok or pan sauté garlic, ginger and onion. Pour 1 cup water and bring to a boil. 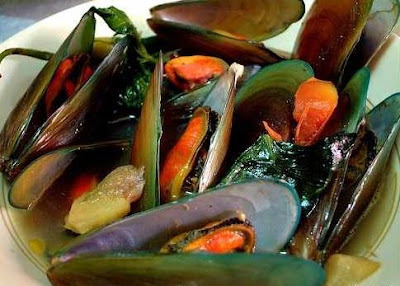 Add mussels and allow water to boil once more and simmer until the shells start to open, now add inkangkong and green sili , simmer for another 2-3 minutes or until done. Serve hot. Eto ang paborito ko Tahong! Ang sarap naman ng picture nakakagutom! heheheh!